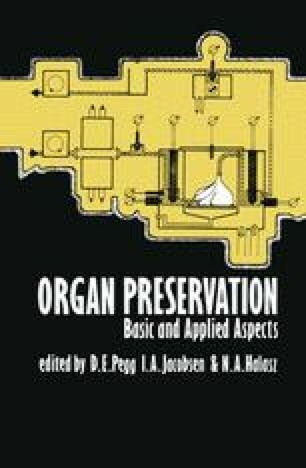 Organ preservation nowadays is limited by the development of cellular damage which is mainly damage to cellular membranes. The course of damage can be slowed down by oxygenated preservation, i. e. continuous perfusion or retrograde oxygen persufflation, but it cannot be prevented. Many efforts have been made to reduce the damaging effects by use of special flush solutions which reduce oedema formation and electrolyte redistribution but a real protection of membranes has not yet been achieved.